Informal real estate prices in North Korea have surged amid a flurry of international diplomacy that promises a more open country for its people. One source said supply used to outstrip demand in Pyongyang, but that has changed since leader Kim Jong-un's summits with the presidents of South Korea, the U.S. and China. Prices of old apartments in Puksae or An Sang-taek street in the capital's central Morangbong district have tripled to US$70,000, according to the source. The neighborhood is filled with high-rise apartments that North Korea built in 1987 and named after a Japanese industrialist of North Korean descent who donated a huge sum of money to the North. It is still home to wealthy Korean-Japanese as well as several restaurants that cater to them and bring in much-needed valuta. One North Korean defector who used to be a high-ranking official in the North, said, "Apartments in Puksae street are considered better quality than others in the capital, but their popularity dropped due to poor power supply. A $70,000 price tag shows that the value has increased a lot." The defector said only North Koreans who work for trading companies based overseas, merchants who made a lot of money in the North and Chinese residents can afford apartments there. 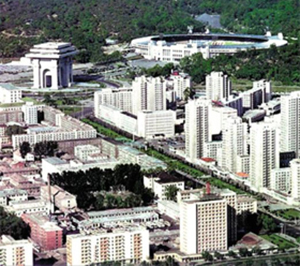 Real estate sales have increased noticeably in other parts of Pyongyang as well. Even apartments that were built more than 50 years ago cost between $3,000 to $30,000, while newly built ones change hands for at least $100,000. All apartments in Pyongyang are bought and sold in dollars. Another source said, "After Kim Jong-un's summits, Pyongyang residents expect good times to come soon. There are also rumors that construction and redevelopment will get going in Pyongyang due to foreign investment." Apartments for senior party and military officials cannot be sold. "Apartments that were awarded as gifts and are owned by the children of revolutionary heroes and by high-ranking officials can't be bought or sold, and the owners are not happy," the source added.